April brings Showers of great new Photos! …And by “showers”, I mean seventeen photos. True, there are eighteen photos in this post, but … um … Well, you’ll figure it out when you get there. Now, on to the photos! Yes, we start out with a Zylmex model! 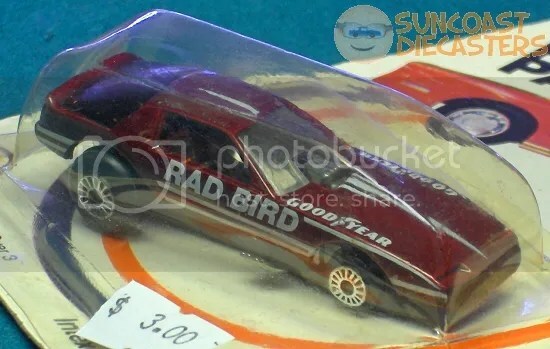 I assure you, the “Rad Bird” shown below (a.k.a. Firebird Funny Car) is indeed from Zylmex. Why am I making much ado about this being a product of Zyll Enterprise Ltd. (Zylmex’s really real name)? As an act of beneficence, I have at least one very good reason for making sure it’s known that this is a Zylmex. Because when it’s Zylmex, it has to be stated clearly! Further proof that this is a Zylmex — also known as “Zee” to its hipster friends. I’m still processing the idea of popping the package. On one hand, I have at least one other on-card Zee, in better condition as well (go back and look at the first photo; this’n has a water stain). On t’other hand, I would have one more on-card Zee, and I do have plenty of funny cars. Well, here’s why it seems famillar — er, familiar: Ken found one a few months ago. And, with his being free of its plastic defense shield, it can show off its trick in its very ’80s way. Ken nabs some nifty treasures. 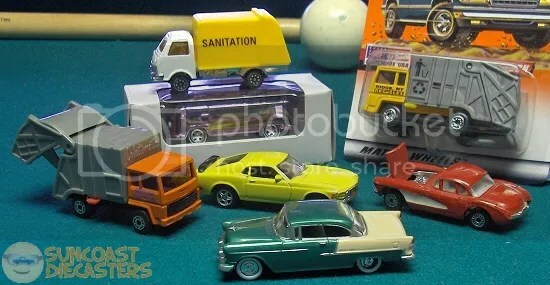 Clockwise from center: 1970 Ford Mustang (Welly); Colectomatic (MBX); Little Johnny No-Name; 2014 Suncoast Diecasters Club Vehicle; Colectomatic (MBX); ’57 Corvette (Zylmex(! )); and 1955 Chevrolet Bel-Air (High Speed). I swear, there must be some factory which produces garbage trucks just for Ken to find. 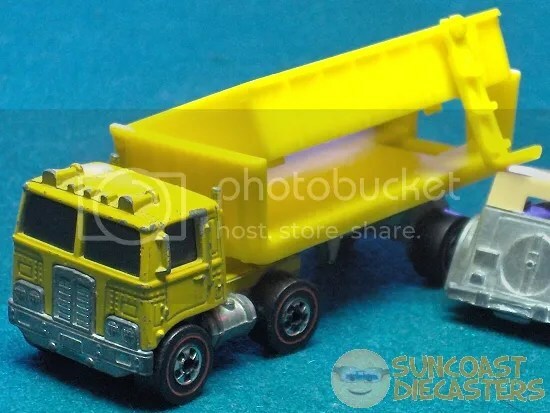 Bill has some awesome finds – particularly that rare yellow dumper, which I’ll tell you about last. 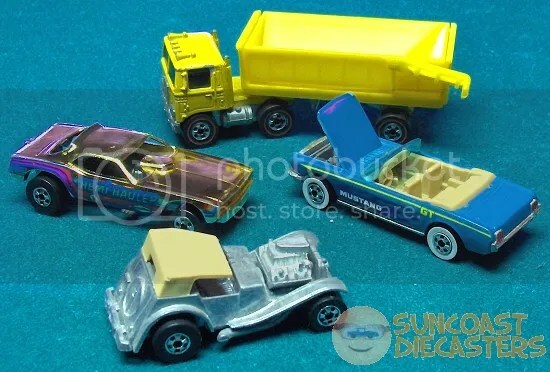 Clockwise from right: ’65 Mustang (1990 Color Racers); Sir Rodney Roadster (France, 1983); Top Eliminator (gold chrome, BW, no “A/C” logo); and finally, last but big ol’ definitely not least, the very rare Road King Truck from the Mountain Mining Set from 1974. The mining truck’s rarity is rated as “Super Duper Awesome”. Showing complete disrespect and utter contempt for poor (and ZAMAC-naked) Sir Rodney, here Road King is using him as a stage prop. No respect, I tells ya, no respect! Actually, the purpose of the completely not-a-typical-truck-part handle is for the child (or Bill) to be able to dump the bed’s contents more easily. 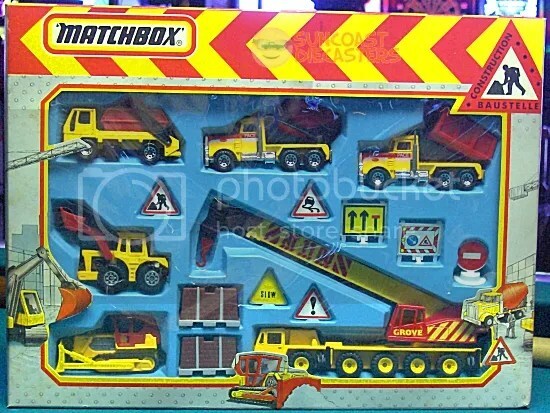 No batteries needed, the Mountain Mining Set was all hand-operated. You know, just like Facebook used to be back then. For parties of 12 or more, Bill will rent out the truck as a picnic shelter. Oh no! It crashed and broked! Actually, I intended to take a pic of its underside when I noticed that unusual block on the base of the cab. It’s about 1/8″ thick, and as Bill explains, it’s a conveyor linkage. The truck follows along a grooved track as the child (or Bill) turns a crank to cycle the truck through the mining operation. Hey! There’s one of them illegal government GPS thingies under there! I’ll let Big Tractor Mike give you goods on this next item: “This is a VERY hard to find set!! You can find the models packaged separately on blister cards or in window boxes. The crane alone, loose, is worth from $30 to $40; carded or boxed, from $50 to $60. There are a few promos for the crane, but are rather pricey. 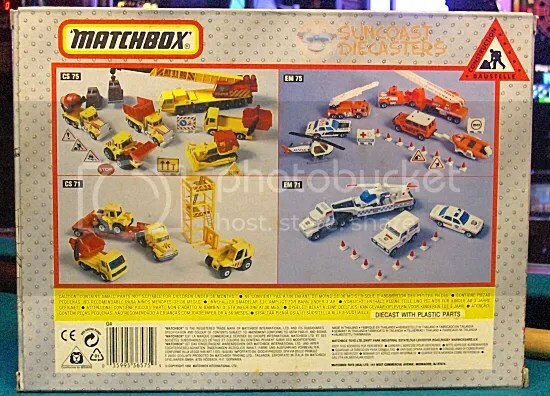 The pic of the crane on the back of this box is of the prototype crane. Notice the all-black wheels and other difference from the packaged model. The crane is sold singly and is part of the MB Convoy line; you don’t see a lot of these cranes around. Can also be found blister carded with two other models. The other models can also be found either blister-carded or window-boxed. $3 to $5 loose, around $6 to $10 packaged. Mike should wrap this up and give it to himself as a Christmas present! The “construction” & “fire” sets look pretty-well stocked. The other two sets seem kinda lackin’…. 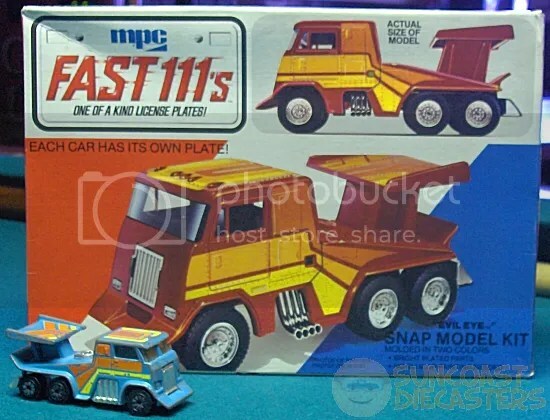 The Lord continues to amaze me with the variety of Kenner Fast111s items that show up at Suncoast Diecasters meetings. Big Tractor Mike gets an odd gleam in his eye, and says to me, he says, “Got somethin’ for ya.” He shows me this box full of The Most Awesome Fast111s Find Ever. As I’d explained before, I had completely forgotten about KF1s until I mis-ID’d one on Ken’s table. I had no clue whatsoever that they’d been licensed to a model maker! 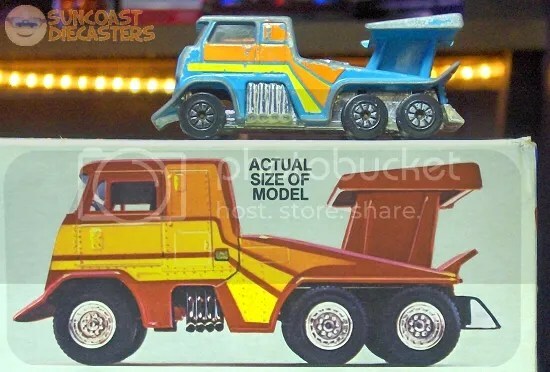 The normal-size diecast version in light blue is from Bill. Note lack of bed-dumping handle. No scale is stated on the box. 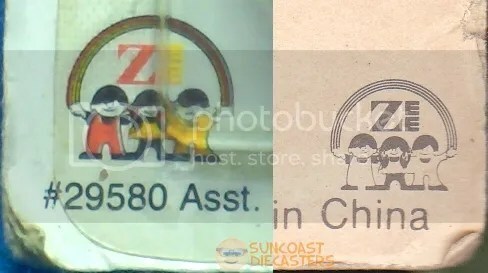 However, in comparing the “ASoM” photo to the diecast – and relating it in me brain to other such dual-scale items in me collection – I’m guessing it’s probably around 1:43 or 1:48, which would be about right. Oh, here’s what’s in the rest of the box: 85% air, plus your Daily Minimum Requirement of styrene plastic (Now with free decal sheet! Collect them all, kids!). By the way, for your edification, MPC is now owned by Round2LLC. 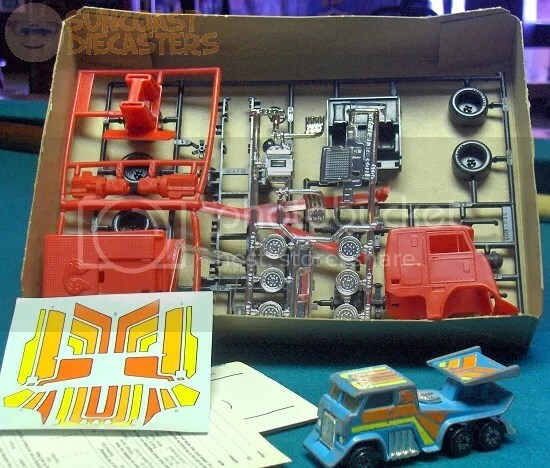 I’m torn as to whether to build it, or just put the whole box in my display cabinet and stare at it dreamingly…. A child (or Bill) could put this on the fridge next to his “outlined fingers” turkey drawing and glued-macaroni sculpture. Well, we’re at the end of the post, and if you’ve noticed the pattern over the last several monthly meeting posts, you know that this is where I make a certain declaration. And yes, I’ll be doing that … but just a bit differently this time. I’m talking specifically about our Find of the Month. Now, sometimes it’s easy, in that one particular item really stands out. Other times there are several such items, and I have to do some arguin’ and figurin’ in my head to pick just one. However, with our April meeting I am faced with a real conundrum: there are two items, each of which is simply overwhelming in the areas of Rarity, Uniqueness, and the all-important (but nebulously-defined) Awesomeness. So, I’ve done the only thing I could which seems both fair, and likely to prevent me from over-frying my brain: I’ve chosen both of them. 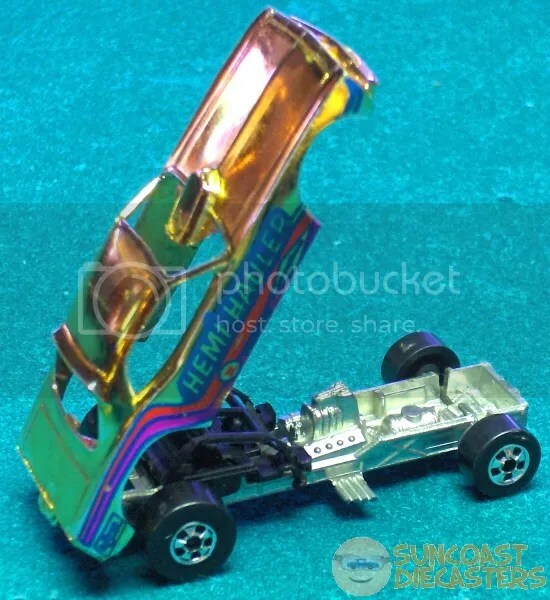 So, without further ado, let me introduce to you the MPC Evil Eye model kit, and the Hot Wheels Road King Truck: Suncoast Diecasters‘ first-ever Dual Finds of the Month! See you at the May meeting! 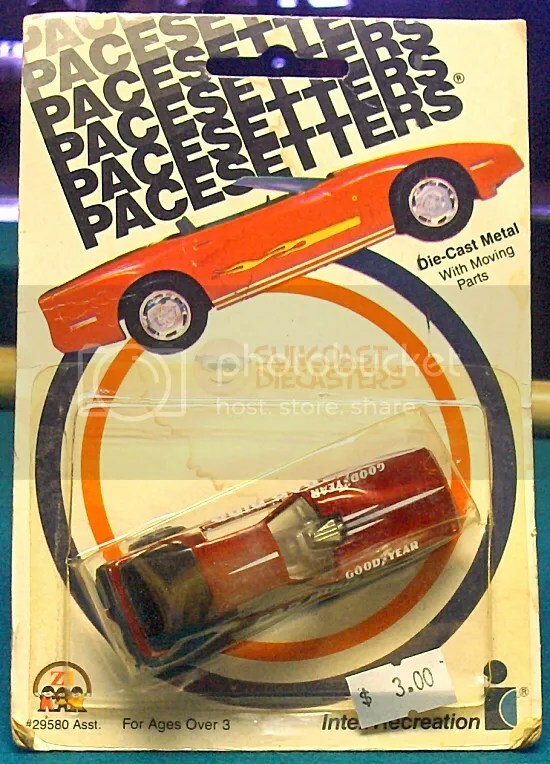 This entry was posted in Kenner Fast111s and tagged Dual Finds of the Month, or Bill. Bookmark the permalink. As always Steve, you do a great job with your monthly meeting reports !! keep up the good work !! Some great photo’s, and good descriptions .